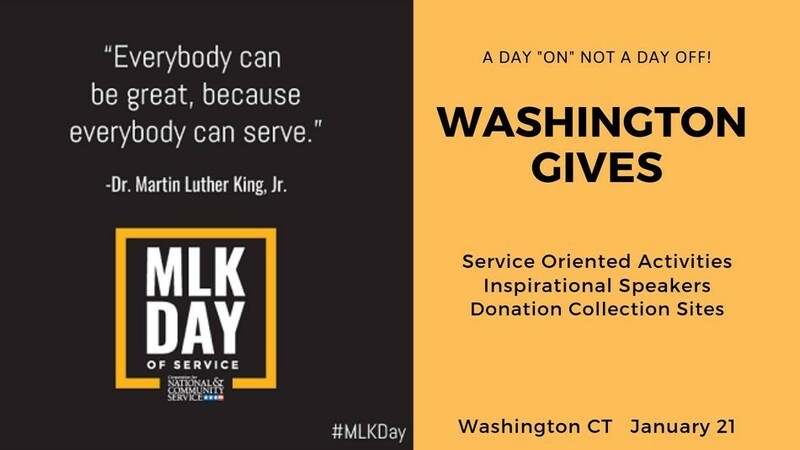 The town of Washington is commemorating the life, works, and spirit of Martin Luther King, Jr. by hosting a day of service titled “Washington Gives.” Each year, the MLK Day of Service is observed as a “day on, not a day off.” It is intended to empower individuals, strengthen communities, bridge barriers, create solutions to social problems, and move us closer to Dr. King’s vision of a “Beloved Community.” All are invited to join with families, friends and neighbors to volunteer and participate in our commemorative day of service. Businesses, schools, and non-profit groups along with the town will come together on Monday, January 21st, 2019 to provide a daylong event filled with service-oriented activities. Reaching out and uniting locally for the benefit of the greater good has always been a hallmark of small towns and Washington is no exception. Supporters of the event are Washington Business Association, The Gunnery, The Judy Black Memorial Park and Gardens, Steep Rock Association, ASAP!, Pilobolus, Shepaug Valley Schools, Hickory Stick Bookshop, Newbury Place, The Hen’s Nest, Washington Environmental Council, William Pitt Sotheby’s R.E., Washington Food Market, Valley Spirit Cooperative and Wellness Center, National Iron Bank and Byrde + the b Salon. The “hub” of this event will be The Judy Black Memorial Park and Gardens. Information will be available at the Park as we start the day with a specific schedule of events and activities. There will also be refreshments available there for volunteers. Events begin at 10 a.m. and run until 2 p.m. throughout Washington with various organizations in support of our greater community in need. Integrated Refugee and Immigrant Services (IRIS), ReRun Shoes for Small Businesses in Africa, New Milford Homeless Shelter Coalition, Washington/Warren Food Bank, St. Vincent De Paul Mission of Waterbury, Fundacion Perros sin Nombre, CT Children’s Medical Center and more. The Washington Business Association, The Gunnery School, Judy Black Memorial Park and Gardens, Steep Rock Association, ASAP, Pilobolus, Hearts of Hope, Shepaug Valley School, Hickory Stick Bookshop, Newbury Place, Washington Food Market, Valley Spirit Cooperative, Washington Pizza House, The Pantry, Stars Hollow Yarns, William Pitt Sotheby’s, Washington Environmental Council, Woodbridge Running, ReRun Shoes, The Hen’s Nest, National Iron Bank, George Home, Town of Washington AND you! Collected goods and monetary donations from this event will be distributed to the following organizations. FISH (Friends In Service to Humanity), Washington/Warren Food Bank, Connecticut Children’s Medical Center, Fundacion Perros sin Nombre, IRIS (Integrated Refugee and Immigrant Services), New Milford Homeless Shelter Coalition, St Vincent De Paul Mission of Waterbury, and more.